You have to check out the ZEITGEIST Religion clip, all I can say is WOW! 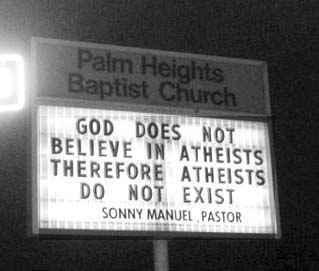 Anyone who has debated the existence of God with a Christian is sure to have been presented with some variant of the following proposition: "If God does not exist, then there is no reason to do x," where x is any kind of behavior that most of us think morality requires. For instance, a missionary that intercepted me en route to the UIC Bookstore last month informed me that if God did not exist, then there would be no reason for one to remain faithful to one's spouse or to care for one's children. Such assertions are meant to imply that atheism is a path to evil, and Christianity a path to good. However, they actually prove quite the opposite.